The Alfa Romeo 183T was a Formula One car designed by Gérard Ducarouge and Mario Tollentino and was used by Marlboro Team Alfa Romeo during the 1983 Formula One season. The car, with a newly designed flat bottom, made its debut at the 1983 Brazilian Grand Prix. Running on French Michelins, the 183T was driven in 1983 by Italians Andrea de Cesaris and Mauro Baldi. The car was basically an updated version of the teams 1982 car, the 182. Gone however was Alfas 1260 V12 which had served the team since1979. In its place was the 890T, a 1.5 liter turbocharged V8 engine (the 1260 engine was still used at the time by the Osella team). The change in engine gave the 183T a significant boost in power. The 1260 V12 was rated at 540 bhp (400 kW) while the turbocharged 890T was rated at 640 bhp (480 kW). However, this still fell short of the 850 bhp (630 kW) power figures quoted by for the turbocharged BMW, Renault and Ferrari engines. During the year the 890T's fuel consumption wasn't a factor as stops for fuel were permitted. From 1984 however, when the FIA imposed a 220 Litre fuel limit on the cars and banned stops for fuel, the V8 engines consumption, plus its shortage of power would see Alfa wane as a Formula One front runner. The 183T took 18 points from 29 entries; Andrea de Cesaris managed to score two second place finishes and also gained one fastest lap at Spa Francorchamps, a race that he started from the 2nd row and led over half the distance. Unlike the preceding Alfa Romeo F1 cars, the 183T chassis was not designed by Alfa Romeo's Autodelta; instead Euroracing's chief engineer Gérard Ducarouge was the main designer (Ducarouge was fired by Alfa less than a month into the 1983 season and was quickly signed byLotus). Euroracing had been earlier successful in Formula 3 with Alfa Romeo engines. 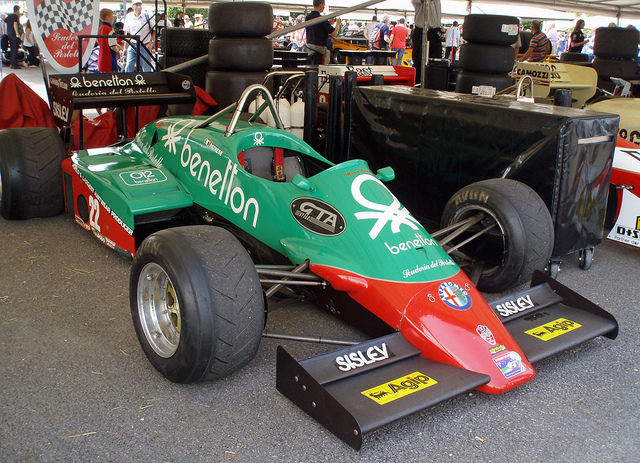 The 183T was retired after the season and replaced for 1984 by the Alfa Romeo 184T. Last updated on 19 December 2013 at 06:11.